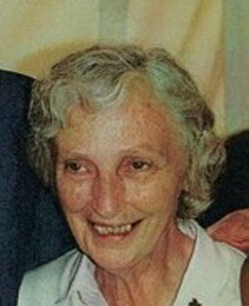 Ellen Conway was born in Boston in July 1936, the eldest of six children born to Dr. James Conway and Mary Campbell Conway. Her brother, Father Richard Conway, has told us that she had her heart set on being a missionary from a very young age. She completed high school and one year of college before entering the Marist Missionary Sisters in Bedford, Massachusetts on July 31st, 1955. Sisters Susan and Pedro both arrived in Peru in early 1964, and went to language school together. In her early years in Peru, Sr. Pedro taught religious education, served as school secretary in Callao, and led women’s Bible discussion groups. She taught English at Pope John XXIII School in Lima in 1975-76. In 1977, she began the ministry that was to absorb her life and energy for most of the rest of her days – prison ministry. In that year she began to minister at a Boys’ Reformatory, and gradually became involved in the ministry at the huge prison of Lurigancho with Srs. Ana Marzolo and Theresa Pasterczyk, and later at Castro-Castro, where political prisoners were held. In 1993 Sr. Pedro was missioned to Monteria, Colombia. She returned to Peru in 1997 and spent the rest of her active days there until she became unwell and had to return to the USA in 2012. In the song: “To Dream the Impossible Dream”, there is a line: “to go where the brave dare not go…” In her ministry in Peru and in Colombia, Pedro often went into situations that were not for the faint-hearted. We’ve already heard the stories of her work in juvenile detention centers, in prisons and especially with people accused of terrorism. She did para-legal work in the courthouse of Lima to try to move the cases of forgotten and abandoned prisoners. We’ll never be able to count the stairs she climbed in the great “Palace of Justice” in Lima—where a Peruvian President once commented: “so much palace for so little justice”. She climbed the stairs to talk to judges and court clerks in order to move along the legal cases of her presos (prisoners). We’ll never be able to count the dusty streets she walked to visit prisoners’ families. The only time Pedro was ever put in the spotlight concerning her ministry was in December of 1983 when she was part of a hostage crisis at Lurigancho Prison in Lima. In later years she, along with Sr. Ana Marzolo and Sr. Madeleine, received Peru’s highest award for Human Rights Work. And more recently Pedro received the Chevrus Award from the Archdiocese of Boston. Pedro’s entire ministry was backed up by hours and hours of prayer. She was by nature, a contemplative and believed in the unique spiritual journey of each person she ministered to. Pedro never gave up on anyone and truly believed in miracles. El Senor de los Milagros—the Lord of the Miracles (a popular Peruvian image of Jesus crucified) was often her recourse. And she loved St. Martin de Porres because he loved the little animals—and so did she! But one of the things that we often forget to mention about Pedro was her service to the community. This service included ministry as Regional Superior of Peru (1985-87), and at another time as Regional Councilor. Pedro also accepted to serve as community superior and bursar. The sisters were attracted to Pedro’s great compassion and ability to listen. However it was part of the Dream, because during these past 4 years between Maristhill, 62 Newton St, then back to Maristhill and in her final weeks with visits from some of her old smsm friends from Peru and Colombia—through it all Pedro has received the care, love and support of family, friends and her smsm sisters. Pedro changed roles and now she was on the receiving end of all the compassion and mercy she had been God’s instrument of in Peru and Colombia. Sister Mary Pedro, as a Marist, believed herself to be “hidden and unknown”. She was disturbed a few years ago when Cardinal Sean O’Malley wanted to present her with the Chevrus award from the Archdiocese of Boston, for outstanding service to the Church. She said she had done nothing in Boston, but some of us tried to persuade her that as a daughter of this diocese, it was right for the Cardinal to recognize her service to the people of Peru and Colombia as part of the Church’s universal mission. She slipped away quietly on the night of July 4th, U.S. Independence Day, while fireworks were booming in the dark sky. She would have been amazed at the messages that poured in from SMSM around the world, from Sisters who had been influenced by the example of her life and ministry. She may have giggled in heaven when she saw us scramble to put out more and more chairs for the many people who arrived for her funeral – loving family and friends, SMSM sisters and former SMSM who had served with her in Peru, seven priests of the Archdiocese, including Auxiliary Bishop Arthur Kennedy, who concelebrated the Mass with her brother, Father Richard Conway. May you rest in peace and in the joy of the Lord, Pedro. And may the example of your Marist Missionary life –especially your devotion to the poorest - remain with us and continue to inspire us.